2005 was the first time voters had decided a gas franchise buyout question. In June of 1955 Collinsville voters approved (193 for - 15 against) a new 25 year gas franchise to "Ruth Fuel Company". Even fewer voters turned out in 1980 when "Gas Service Company" (& it's heirs) was granted a 25 year gas franchise. That June 1980 vote was 58 for and 7 against (out of 1,343 registered Collinsville voters). ONG took over that 1980 originated franchise about 4 years ago. Tulsa County Election Board ONG offers a differing gas cost analysis at Aug. 4th Town Hall meet. Opportunity Lost? -or- Disaster Averted? The overwhelming majority of Collinsville voters Tuesday sent the message to City officials they were not willing to risk the City's proposed gas franchise buyout. A total of 588 "no" votes were countered by only 261 "yes" votes. 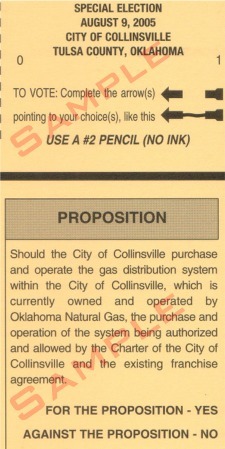 A steady stream of mailers, recorded phone messages and meetings apparently raised a "reasonable doubt" in the mind of enough voters to pull the plug on the City's plan to purchase and operate the gas franchise currently operated by ONG in Collinsville. The City's early decision to withhold the details of their appraisal value and operational estimates (to keep ONG from gaining an advantage "In negotiations") may have backfired as ONG and local opponents used that lack of information to reinforce voter concerns with the proposal. By the time the City's numbers were released, the damage was already done. The City's handling of a recent trash service provider change may have also contributed. The City and ONG will now need to hammer out a new franchise agreement as the old 25 year agreement expired in June. Key issues will likely be the city charter calling for a 4% franchise fee (despite only 2% being collected and remitted by ONG on the past franchise) and the inclusion and terms of another buyout option. 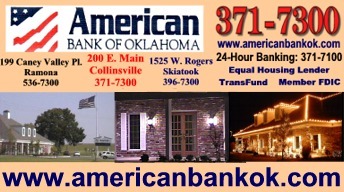 The City of Collinsville will also face the challenge of finding an alternative to their potential plan of raising (gas) revenue for future City growth with some other revenue source. Flat and declining sales tax revenue may leave the City with some potentially painful choices between level of services and rate increases for those services. This was the first city-only election conducted by the Tulsa County Election Board for Collinsville which had conducted their own elections until a recent city charter change. The three polling places had an interesting distribution of voters as the one farthest from downtown (southwest of town at 126th St. North & Memorial) counted only one "un-voted" ballot (i.e. no yes or no votes). The downtown polling place recorded 307 votes (84 yes and 223 no). The polling place east of town had the most voters with 542 (177 yes and 365 no). Those precincts had the following totals of registered voters: 327, 1792 and 2790. Those registered voter counts include residents outside the city limits which were ineligible for this election. It was estimated that only about 2700 (of those 4909) actually lived inside the city limits indicating a 31% turnout of eligible voters today (849 of 2700). At least three poll workers apparently had a lonely day at Maranatha Baptist Temple Tuesday as not a single valid ballot was collected.